The award-winning redesign of Cremin Playground has transformed this compact space from a "trouble spot" to a source of neighborhood pride. In this renovation, customized play structures incorporate accent lighting to highlight the structure's roofs and deter unwanted nighttime activity. A musical chime fence, other outdoor instruments such as bongo drums, and weather-proof chalk boards offer creative outlets for all ages and accessibility needs. Glowing LED lights are incorporated into low curving seat walls that supplement the site furniture and guide circulation through the park. These cast-in-place concrete walls showcase CBA's attention to detail through chamfered skate deterrents and sections that "float" in order to preserve the root systems of existing mature trees. Previously, the park was divided in two sections by a pedestrian bridge ramp that ascended the middle of the site. CBA lowered the grade below the ramp to allow easy access between the two sides, which visually and programmatically unifies the site. Colorful murals by local artist Joe Barillaro, bright painted waves, and strategic uplighting transform the ramp and the adjacent building walls into art elements. To manage stormwater through the newly created low point and throughout the park, CBA specified bands of ceramic pavers that are permeable to water which speak to the park's sense of flow and movement. 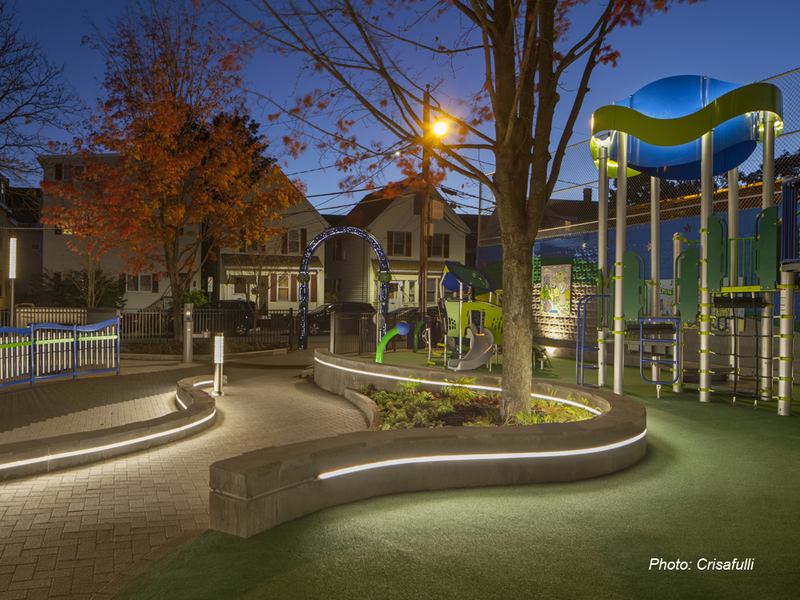 Cremin Playground was featured in the April 2017 issue of Landscape Architect and Specifier News, and was the winner of the 2018 Northeast Hardscape Award of Excellence in its category (Non-Residential over $200,000).